Maria O’Brien’s practice involves painting and drawing. She has a Masters in Fine Art and a First Class Honours Bachelor of Arts in Fine Art Painting from the National College of Art and Design and a Higher Diploma in Art Education from Limerick School of Art and Design. She has vast experience teaching both at second level & in the adult education sector. 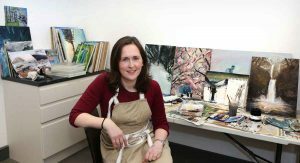 Maria is a resident artist in Laois Arthouse Studios, Stradbally, Co. Laois http://www.arthouse.ie/resident-artists. Support for North Tipperary Artists Bursary 2006, 2008, 2011 North Tipperary County Council.